Arrow Spacemaker Garage Storage Cabinets are manufactured out of steel and will help you organize your garage, basement, utility room or any other high impact areas. 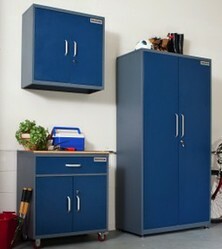 Arrow Spacemaker storage cabinets are made from 100% heavy gauge steel. All the cabinets have easy grip handles, adjustable shelves and cabinet locks.. The base unit with drawer has ball bearing drawer glides and a lockable door, plus lockable wheels for secure storage. The tall Locker cabinet has an exclusive sports netting and adjustable leveling feet to make sure nothing falls out of the cabinet for secured storage. The wall unit made from steel has locking doors and adjustable shelving. Use these storage cabinets in any area of your home that you store sporting goods, home and garden material, automotive products, tools and much more. The sturdy construction, these cabinets are made from steel, they are perfect for an area of hard use, such as a basement, garage or a workshop. These storage cabinets can take the beating and still look great. The best way to keep your items looking new is to store them somewhere you can keep the dirt and daily grim off of them. These metal storage cabinets are a great fit for the active person. Put your basketballs, footballs, skiing equipment inside the tall unit. No more moving these items out of the way. No more stepping on your kids sporting goods to get to your tools. Put you sporting goods where they belong inside an Arrow Spacemaker Metal Storage cabinet. Another great feature about adding storage cabinets to your garage is that you give your garage back to your car. Take all that junk laying around in boxes or on the floor and put them away in a nice new steel cabinet. The more cabinets you have the more room you can make for your car. Make your neighbor jealous of your nice clean garage with these great looking storage cabinets. Your garage door is always open, how quickly will you become the envy of your neighborhood having these durable and attractive cabinets in plain view. No more bottles of WD40 laying around, no more oil cans, no more fertilizer bags just laying in the corner waiting to step on, organize your garage with the Arrow Spacemaker Garage Cabinets. These storage cabinets come in an easy to assemble kit, which anyone with a little DIY knowledge can handle. You can have one or two or you can have 20 of these garage storage cabinets. Whatever your desired storage needs these steel cabinets can handle the use. Arrowspacmaker.com offers all the Garage storage cabinets in a package at 10% off the retail price. Get the storage needs you want at a price that is friendly on the wallet. Remember by keeping your things inside a cabinet or wall storage unit you are keeping money in your wallet. You step on fewer things by putting them into a storage cabinet, thus you save money and keep your wallet closed.